Imagine a one-stop vacation shop. A place that could offer departures to all destinations for day trips, all the toys for water sports and combine a professional and well-established dive center to round off the package. 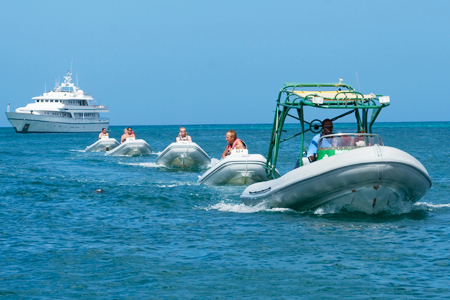 Aqua Mania Adventures is located at Simpson Bay Resort & Marina and has over 20 years experience in the customer service industry with friendly and reliable staff. These are the people to plan your unforgettable vacation. St. Maarten is surrounded by four beautiful islands - the French jewel of St Barts, the unspoiled Dutch Queen, Saba, and the two British sisters Anguilla and Prickly Pear Cay await discovery. Each day you have an exciting opportunity to explore and enjoy a new country and culture. Aqua Mania Adventures offers Edge I & II high speed ferries to St Barts and the only constant service to Saba. State of the art sail cats, Lambada and Tango, are the best way to travel to pristine white beaches and the aquamarine waters surrounding Anguilla and Prickly Pear. Great snorkeling at these destinations and local restaurants provide a tasty BBQ lunch. If you prefer a half-day sightseeing and snorkeling combo, Sand Dollar is a popular outing with departures twice daily. Captain Alex is a dedicated and amusing companion for the three-hour trip, and snorkeling at Creole Rock caters to the experienced and novice alike. This is a trip to christen that new gear or knock the cobwebs out of the trusted antiques. If you envision days of lazing under palm trees sipping pina coladas, and roasting a deep golden brown, then surely by evening you will be ready to tap your feet to the Caribbean steel drum beat. Lambada and Tango provide the best seat in the house to watch breathtaking tropical sunsets. Take a two-hour cruise on Lambada with drinks and snacks, before dinner at one of the 350 fantastic restaurants, or a sumptuous Creole buffet aboard Tango for a longer evening of picnic dining, and dancing underneath the stars. Thought that was it? If you snorkel and swim, why haven't you tried Scuba? It is the most natural progression, and the common thought is, if you can breathe you can scuba. Try a one-day discovery course or get your certification card. Dive wrecks and reefs and hone your skills on advanced and specialty courses. With Dive Shop Manager Vinny at the helm, Dive Adventures takes you by the hand and shows you a side of St Maarten you will never forget. This is an adventure with Dive Adventures. Day trips for diving in Saba on walls and pinnacles are opportunities for world-class diving. Now what vacation would be complete without thrill seeking? Wave runner tours, parasailing, kite surfing, waterskiing, and eco tours like kayaking and mountain biking are all available for first timers and experienced participants. Plan a private charter for your birthday, wedding or family group with a variety of vessels to exotic destinations.